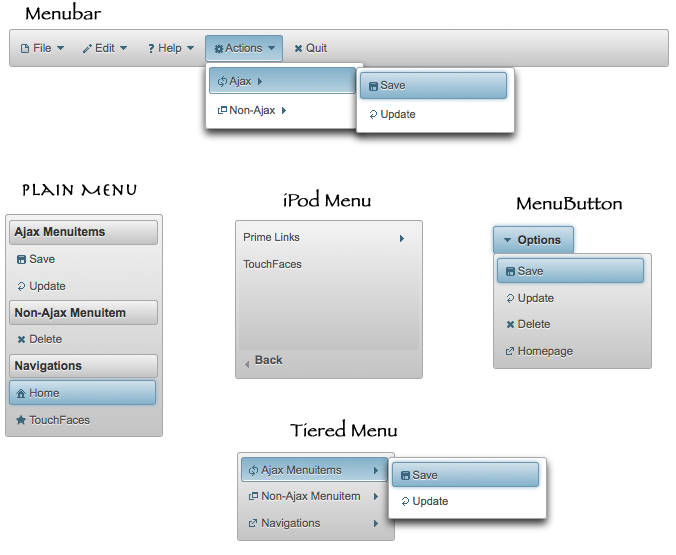 For the last couple of days, we were busy with improving the menu components (menubar, menu, menubutton and contextmenu) of PrimeFaces. Process of shifting away from YUI towards jQuery has started in PrimeFaces 2.1 and menu components were some of the remaining YUI based components we have ported to themeroller skins in 2.0.x->2.1. As like any other port, some issues came up also we’ve figured out ways to improve the ease of use. PrimeFaces is now integrated with wijmo project which consists of extensions of jQuery UI including menu widget. Long story short, menus are rewritten, improved and simplified. As a side bonus, ipod style menu is added to menu family. Quite some time is spent on backwards compatibility, other than dynamic positioned menus, it is backwards compatible. First of all thanks to APRESS for sending me a copy of “Practical RichFaces” book free to review. They’ve sent it along with the 10 copies of “The Definitive Guide to Apache MyFaces and Facelets” which I’ve co-authored. Practical RichFaces is written by Max Katz, I met Max several times in conferences such as JSFDays, JSFOne. He’s a great guy as a person and an expert in the field. About the book, “Practical RichFaces”, as it’s title promises contains practical examples of developing rich JSF applications with RichFaces component library. RichFaces is a mature, stable component library with a huge community. (I hope I can say the same for PrimeFaces in the future as well ) RichFaces also has a detailed reference guide so you may ask do I need this book to work with RichFaces? of course not, but it’s a great resource to keep close since it contains “How to’s” to common requirements in apps and real life examples not available in RichFaces docs. In addition for Turkish users, Turkish is built-in. Editor is also skinnable using CSS, following is just an example. For the live examples, checkout the online demo. Check out the online demo to see confirmDialog in action. Well, all the credit of this release goes to my friend Acegi guru Kenan Sevindik. For those who don’t know much about this library; it is the JSF implementation of the ACEGI’s jsp tags as JSF components. They’re referenced in Acegi’s homepage and as far as I know used in appfuse. The long story is at Kenan’s blog. For the next release hopefully we’ll add the acl tags to provide domain object level security on jsf pages. I’m in Core JavaServer Faces 2nd Ed. A friend of mine just sent me an email mentioning that my work made it to the 2nd Edition of Core JavaServer Faces Book. It’s my charting component; JSF Chart Creator. Page 628 – Core JavaServer Faces 2nd Ed.